The developers changed what happens when you drop an ally. You must now own an ally for a minimum of 15 days to receive the maximum refund value of 60% of their hire value. Dropping an ally before owning them for 15 days is scaled based on how long you've owned the ally, with a minimum of 4.5% refund if dropped on the day you hire them. Assuming a linear scaling, you will get an additional 3.96428571429% per day, starting on day 2 of ownership. Hire an ally worth 1,000,000 gold. Drop on day 7. Day 2 = 4.5% + 3.96428571429% = 7.96428571429%. So, 1,000,000 x 8.46428571429% = 84,643 gold. Day 3 = 8.46428571429% + 3.96428571429% = 12.4285714286%. So, 1,000,000 x 12.4285714286% = 124,286 gold. 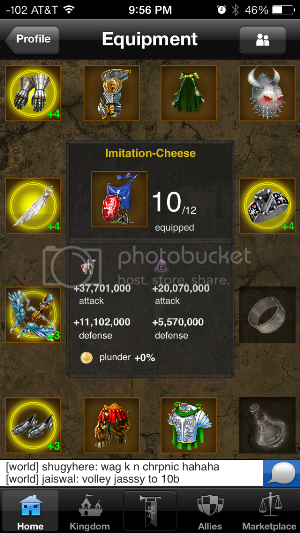 Day 7 = 1,000,000 x 24.3214285714% = 243,214 gold. Day 15 = 1,000,000 x 60% = 600,000 gold. Last edited by Imitation-Cheese on Jan 22 2014, 2:15am, edited 1 time in total. Why Did My Ally Reset? Which allies can be reset by the devs? How long must an ally be inactive before they are reset by the devs? Q What is a reset bomb? AReset bombs are alternate accounts made by other players. Their purpose is to maximize the amount of gold you lose, based on the fact that the ally reset before you regain the maximum 60% refund rate, as per the devs' ally refund nerfing. This means that if you hire a reset bomb ally, you may lose up to 95.5% of their hire value! Be careful of which allies you hire! Ouch! 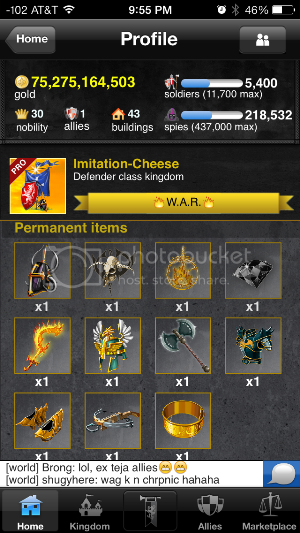 Last edited by Imitation-Cheese on Jan 30 2014, 2:37am, edited 7 times in total. Permanent equipment are items you get by purchasing pro packs from the Oracle. You retain these items when you reset. Regular equipment comes from epic battle drops and Alchemist purchases. All regular items are lost when you reset. Last edited by Imitation-Cheese on Jan 22 2014, 9:56pm, edited 2 times in total. How do I Use Equipment? Permanent equipment is always active, but not visibly by anyone except you. You can view your equipment by tapping on the profile button on your home screen and scrolling all the way to the bottom. Tap on a slot to see your equipment available for that slot and then tap "equip." Last edited by Imitation-Cheese on Jan 22 2014, 10:00pm, edited 1 time in total. BFE is your bonus from equipment. Similar to BFA, you take the raw stats from your equipment and multiply it by 0.02 to get your BFE. Or you can just add your equipment stat boost to your raw stats, if that's what you're interested in. Your BFE raw stats can be found on your equpment page. Equipment stat boosts are static, which means it doesn't lower with your troop level. The exception to this are equipment items that give percentage boosts, like the Abyssal Blade - these items do scale with troop level. Last edited by Imitation-Cheese on Jan 22 2014, 10:10pm, edited 1 time in total. Q What equipment should I use? A This really depends on your strategy and build. For example, your first instinct might be to go for equipment that boosts your troop power if you're an attack build. But if you have a piece of equipment in that slot that boosts your spy stats, you might benefit more from using the spy equipment. There are several combinations available, and you can configure your equipment to your liking. Experiment a little to find what works best for you. Last edited by Imitation-Cheese on Jan 30 2014, 2:37am, edited 2 times in total. How Do I Enchant My Equipment? Q How Do I Enchant My Equipment? A There are two ways to enchant your equipment. The enchantment page for each piece of equipment will tell you how much aqua/inferno/mithril you'll need for the next enchantment level. Last edited by Imitation-Cheese on Jan 30 2014, 2:38am, edited 2 times in total. If you are being attacked, the first thing you should do is size up your target. Take note of their stats. Try to find a weakness that you can exploit. For example, if they have strong spy stats but weaker troop stats than you, you can attack them back with troops. Avoid posting on your opponent's wall - this will give him/her a quick and easy link back to your kingdom. If they post on your wall, you can simply click on their name any time you want to attack them, without having to search for them in the battle list. Keep in mind that spies can attack troops and spies simultaneously with assassinations, so you'll need to find a way to protect your troops from assassinations, so you can hit your enemy back. One of the fastest ways to do this is to buy some spy defense pots or fire up a spy mithril spell. Keep in mind that even though this will cost you a lot of gold, your opponent is not earning any gold by assassinating your troops, so you'll have the advantage as far as replenishing your pots during the battle. If you have enough gold available, you should look into buying some spy defense towers. Tower spy defense is static, which will be very useful as your opponent's spies get lower and lower. If your opponent has more troop power, and you have more spy power, you should try to keep their troops pinned with assassinations. If they have SDP, be resilient - keep assassinating them, even if you fail. You'll eventually burn through their SDP until you get through. Make sure that if you're spy-heavy, you stay active in an epic battle to keep your troops pinned on the EB to keep your gold income steady and to prevent your opponent from being able to attack you. For both builds, you should make sure to bank your gold once the battle beings, so you minimize your losses. Last edited by Imitation-Cheese on Jan 26 2014, 2:23am, edited 1 time in total. If you're being farmed, you need to prepare to settle in for the long-term. Some farmers are more resilient than others, so you'll need to weigh your willingness and ability to counter their threat against your abilities. Most farmers will have some kind of demand that they will want met. This can be anything from hiring their crappy allies to posting an apology on their wall or in forums. This is how players surrender in KaW. If surrender isn't your style, you need to start planning your KaW future. Some farmers will give up and leave you alone after a few hours or a few days. Others will not stop for weeks, months, or years. One thing you definitely DON'T want to do is provoke your farmer. Don't post on his/her wall. Don't talk about them in forums or in WC. Don't acknowledge them if they post on your wall or follow you. The best thing you can do to deter a farmer is to ignore them and simply fight back. Most farmers are just looking to get some kind of reaction out of you to see how upset you'll get. Don't let them get the best of you, or you'll fall into their trap. Last edited by Imitation-Cheese on Jan 26 2014, 2:33am, edited 1 time in total. Opponent Too Strong means that your target is outside your hit range. The reason this exists is to protect very powerful players from being pinned by tons of tiny accounts - this is a game exploit. In order to be able to hit a target that is too strong for you, you must either upgrade your kingdom to boost your stats or hire enough allies to move your BFA into their hit range. Last edited by Imitation-Cheese on Jan 26 2014, 2:37am, edited 1 time in total.